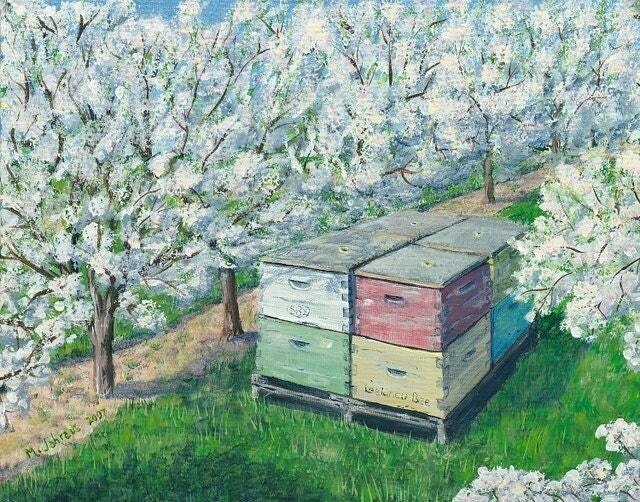 Fun colored bee boxes placed in the orchard to pollinate the cherries. Spring time in Leelanau County, Michigan. This is a limited edition sprayed on giclee' of the original acrylic painting. Edges of the cotton canvas are gallery wrapped so no frame is required. Ready to display. This is a beautiful piece of art! The shop owner was personable and even reached out to me to see if I wanted to purchase a frame that would fit the size and style of this piece. Quick shipping, too. I would definitely recommend this shop! I absolutely love this colorful picture and its driftwood frame. It is beautiful, and it reminds me of summers in northern Michigan. Love ducktoswangallery. Always great products. Exchanges may be allowed. Please email for details. USPS will be used whenever possible. All shipping and handling costs are listed with the item.